The 2007 Solomon Islands earthquake took place on 2 April 2007, near the provincial capital of Gizo on Ghizo Island, in Solomon Islands. Its magnitude was estimated at 8.1 on the Mw scale, and 7.8 on the Ms scale. The tsunami that followed the earthquake killed 52 people. According to the USGS, the earthquake was recorded around 7:39:56 a.m. local time (UTC+11). The focus was 10 km (6 mi) deep and 40 km (25 mi) South South-East of Gizo township on New Georgia Islands in Western Province. There were numerous aftershocks, the largest of which had a magnitude of 6.2. 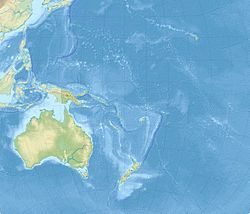 The Australia, Woodlark, and Solomon Sea plates converge to the east-northeast or northeast against the Pacific plate with velocities of 90–105 millimetres/year. Along much of the plate boundary between the Pacific plate and the Australia/Woodlark/Solomon Sea plates, relative plate-motion is accomplished principally by subduction of the Australia/Woodlark/Solomon Sea plates beneath the Pacific plate. The earthquake's location and focal mechanism are consistent with the earthquake having occurred as underthrusting of the Australia/Woodlark/Solomon Sea plate beneath the Pacific plate, as part of the broader northeast-directed subduction process. The length of faulting was estimated to be about 260±50 km. The Solomon Islands arc as a whole experiences a very high level of earthquake activity, and many shocks of magnitude 7 and larger have been recorded since the early decades of the twentieth century. The 2 April earthquake, however, nucleated in a 250 kilometre-long segment of the arc that had produced no shocks of magnitude 7 or larger since the early 20th century. A tsunami warning was issued for the South Pacific Ocean, and advisories issued for Japan and Hawaii. The Australian Bureau of Meteorology issued a warning for Australia's eastern coast, from Queensland's Barrier Reef to Tasmania, and beaches along the coast were closed, while many evacuated to higher ground. However, as the epicenter was close to the Solomon Islands, the tsunami hit before the Hawaiian Pacific Tsunami Warning Center released the warning. As high-magnitude ocean waves propagate at high speeds close to 25 meters per second, they traversed the 55-kilometer distance from the epicenter to Gavo in less than 20 minutes. The S-waves from the earthquake shook the ground and alerted the population, allowing many to flee to high ground before the wave struck. From Honiara, one of the first warnings came from the People First Network's Simbo email station, situated close to the epicentre. PFnet's Technical Advisor David Leeming relates that 20 minutes after the earthquake, Nickson Sioni from Simbo came on the (HF) radio and announced the arrival of a huge wave that had washed away several houses and come inland about 200m. This information was passed on by telephone to the Hawaii-based Pacific Tsunami Warning Center who then upgraded their warning to an "expanding regional alert". This was achieved before the 35-minute arrival time of the wave for the capital Honiara, which in the event proved non-destructive. Coastal damage in the Solomon Islands shows the effects of the resultant tsunami. At least fifty-two people were reported to have been killed and sixty reported missing when a tsunami triggered by the earthquake struck the Solomon Islands, wiping out thirteen or more villages. Thousands were left homeless, and damage is estimated in the millions. The largest waves were reported on the northern tip of Simbo Island, where maximum tsunami run-ups were 12 m, completely washing away two villages, Tapurai and Riquru, and killing 10 people. In South Choiseul, waves 10 meters high swept away villages, gardens and a hospital. About 900 homes were destroyed. Aid workers reported that an outbreak of diarrhoea emerged among the survivors. However, the UN reported that the outbreak and other diseases were under control as of 12 April. On 18 April, a measles outbreak was reported and an immunisation program was underway. The island of Ranongga in the New Georgia Group was lifted three meters by the earthquake, causing its beaches to shift outwards of up to 70 meters. Large coral reefs in the area are now largely above the surface and local fishermen are worried that the fishing grounds have been destroyed. However, Australian scientists said the exposure of the reefs are a normal part of island building and that careful wildlife management can preserve the reefs that remain. Australia committed to contribute an initial 3 million AUD in emergency aid, later increased to 5.7 million as of June 2007. New Zealand gave 950,000 NZD during the initial relief period, and committed 7.5 million NZD over two years to reconstruction, as of July 2007. The United States contributed US$250,000 in aid. Taiwan contributed US$214,000 and shipment of 1,000 kg of rice. France has also airlifted supplies via New Caledonia. The United Nations established a field hospital in Gizo, with a total of eight planned for the entire country, and also established three camps for internally displaced persons. Australian and Canadian medical teams have also been deployed across the islands. Papua New Guinea, itself affected by the tsunami, has contributed US$340,000 and a light plane that can better access smaller, more remote airstrips. UNICEF issued an appeal for US$500,000 for both the Solomon Islands and Papua New Guinea. Separately, the Red Cross has issued an appeal for US$800,000. The remoteness of some villages meant that aid did not reach them until several days after the tsunami occurred. However, the Associated Press reported on 6 April that Gizo's airport had reopened, easing the delivery of supplies. A Taiwanese fishing boat ran aground on coral reefs while delivering supplies, but it was successfully evacuated by a United States Navy helicopter. The boat's crew managed to free the vessel from the rocks a few days later. Francis Billy Hilly, the MP for Simbo Island where 10 people died, said on 8 April that those who had previously resisted resettlement away from the island's active volcano were reconsidering their options. The national government may also relocate islanders away from low-lying areas pending a review of long-term rehabilitation and disaster preparedness plans. The Australian government announced that a network of five tsunami warning buoys will be deployed along its Pacific coast, with two buoys stationed in the Papua New Guinea/Solomon Islands area. ^ a b c "Magnitude 8.1 - SOLOMON ISLANDS - Summary". USGS Earthquake Hazards Program. USGS. Archived from the original on 6 April 2007. Retrieved 2 April 2007. ^ Furlong, K. P.; Lay, T.; Ammon, C. J. (2009). "A Great Earthquake Rupture Across a Rapidly Evolving Three-Plate Boundary". Science. 324 (5924): 226–229. Bibcode:2009Sci...324..226F. doi:10.1126/science.1167476. PMID 19359581. ^ "Deadly tsunami strikes Solomons". News Limited. 2 April 2007. Retrieved 2 April 2007. ^ "Towns evacuated amid tsunami panic". News Limited. 2 April 2007. Archived from the original on 9 February 2008. Retrieved 2 April 2007. ^ Christopher Joyce (2 April 2007). "Tsunami Moved Too Quickly for Warning System". National Public Radio. Archived from the original on 6 April 2007. Retrieved 3 April 2007. ^ "Report: Tsunami leaves thousands homeless in the hills". News Limited. 2 April 2007. Retrieved 3 April 2007. ^ Fritz, Hermann; Kalligeris, Nikos (2008). "Ancestral heritage saves tribes during 1 April 2007 Solomon Islands tsunami". Geophysical Research Letters. 35 (L01607). Bibcode:2008GeoRL..35.1607F. doi:10.1029/2007GL031654. ^ "Report: Death toll in Solomons at 15". News Limited. 2 April 2007. Archived from the original on 9 February 2008. Retrieved 2 April 2007. ^ "Report: Solomons tsunami aid stepped up". BBC News. 2 April 2007. Archived from the original on 7 April 2007. Retrieved 2 April 2007. ^ "Houses float in sea of devastation". News Limited. 2 April 2007. Retrieved 2 April 2007. ^ Taylor, Frederick; Richard W. Briggs; Cliff Frohlich; Abel Brown; Matt Hornbach; Alison K. Papabatu; Aron J. Meltzner; Douglas Billy (2008). "Rupture across arc segment and plate boundaries in the 1 April 2007 Solomons earthquake". Nature Geoscience. 1 (4): 253–257. Bibcode:2008NatGe...1..253T. doi:10.1038/ngeo159. ^ Sands, Neil. "Quake lifts Solomons island out of the sea". Yahoo! News. Yahoo! Inc. Archived from the original on 9 April 2007. Retrieved 9 April 2007. ^ "Quake lifts Solomons island metres from the sea". Daily News & Analysis. 7 April 2007. Retrieved 7 April 2007. ^ "Australia provides $2.7 million for Solomon Islands post-tsunami reconstruction". 19 June 2007. Retrieved 11 November 2008. ^ "Tsunami recovery package for Solomon Islands". Retrieved 11 November 2008. Wikimedia Commons has media related to 2007 Solomon Islands earthquake. This page was last edited on 12 January 2019, at 06:47 (UTC).